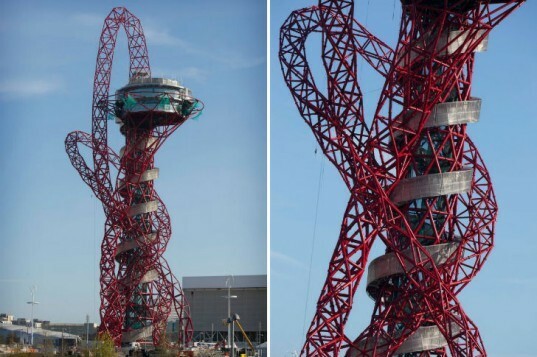 The crazy, twisting ArcelorMittal Orbit observation tower in London is now complete and final preparations are underway for visitors before the start of the games this Friday. 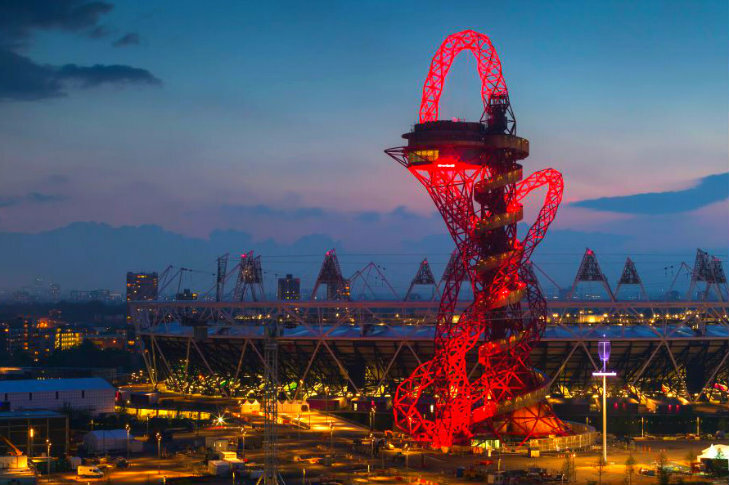 The spiraling red steel tower provides views of the Olympic Park, and it was designed by Anish Kapoor, engineered by Cecil Balmond, and sponsored by ArcelorMittal, a sponsor of the London 2012 Olympic and Paralympic Games and a global leading steel company. The tower, which is both a structure and a work of art, has been constructed out of 60% recycled steel and reaches a height of 114.5 meters. The ArcelorMittal Orbit is an observation tower located in the heart of London’s Olympic Park and stands at almost 4,500 feet tall. The sculpture was designed by Anish Kapoor, and structural engineering was done by Cecil Balmond. Visitors to the tower will ascend via an elevator in the core to enjoy the observation deck at the top. The platform will afford panoramic views of up to 20 miles, encompassing the entire Olympic Park and London’s skyline beyond. After their visit is over, visitors will be encouraged to descend via the 455 steps that were designed to make the visitors feel as if they were orbiting around the structure. Or just get really dizzy. ArcelorMittal, the sponsor of the tower and the Olympics, is a leading steel manufacturer and provided the material for the sculpture. Construction of the ArcelorMittal Orbit took 18 months and required 560 meters of tubular red steel to form the lattice superstructure. Almost 60 percent of the 2,000 tonnes of steel used in the sculpture were drawn from recycled sources. Steel was chosen for its unique properties including strength, modular structure, advantages of weight and speed of construction and recyclability. The exterior of the structure is outfitted with 250 colored spotlights that can be controlled and programmed for special effects. According to http://orbittower.org.uk it's actually 316 feet tall, but more usually quoted as 96.3 metres, being in Britain. You know, I'm not quite believing that this tower is 4,500 feet tall. I'm thinking more like 450. The ArcelorMittal Orbit is an observation tower located in the heart of London's Olympic Park and stands at almost 4,500 feet tall. The sculpture was designed by Anish Kapoor, structurally engineered by Cecil Balmond. Visitors to the tower will ascend via an elevator in the core to enjoy the observation deck at the top. The platform will afford panoramic views of up to 20 miles, encompassing the entire Olympic Park and London’s skyline beyond. After their visit is over, visitors will be encouraged to descend via the 455 steps that were designed to make the visitors feel as if they were orbiting around the structure. Or just get really dizzy. ArcelorMittal, the sponsor of the tower and the Olympics, is a leading steel manufacturer and provided the material for the sculpture. Construction of the ArcelorMittal Orbit took 18 months and required 560 meters of tubular red steel to form the lattice superstructure. Almost 60 percent of the 2,000 tonnes of steel used in the sculpture were drawn from recycled sources. Steel was chosen for its unique properties including strength, modular structure, advantages of weight and speed of construction and recyclability.